I’m going to digress from my usual recounting of recent events, and go back to October 2010, when Compline Choir took part in the filming of a scene from the movie Nothing Against Life. The film, directed by Julio Ramirez, was shot entirely on location in Seattle It follows four characters – two men and two women – whose lives intertwine in the final days before each attempts suicide. Nothing Against Life centers around this taboo subject, and is intended to raise consciousness about suicide, and inspire people to get and/or give help before it’s too late. One of the four characters, a young woman named “Wave”, comes to the Compline service at St. Mark’s, and finds a few moments’ peace from her troubled relationship with her religious fundamentalist parents. Since we don’t allow photography during the Compline Service on Sunday evening, the filming took place on a Friday evening, with movie “extras” as Compline attendees. In the scene, which lasts about three minutes, the camera pans over the Compline Choir chanting, and then picks up Wave and follows her as she enters the cathedral and walks up the center aisle to sit on the stairs beneath the altar with a number of other young people. She makes eye contact with a young woman who smiles at her. Jason Anderson, the director of the Compline Choir, had picked out several things for us to chant in simple plainsong while the action was taking place: “Jesus, thou Joy of loving hearts” and Psalm 91. It was actually my writing last week about Psalms 4 and 134 that got me thinking about Psalm 91, because the three of them, taken together, are the psalms that St. Benedict selected to be sung every night at Compline. I am with him in trouble; I will rescue him and bring him to honor. Among the many things I could say about this psalm, I will select two for now. First, if we are bound to God in love (verse 14), then we are at one with the power, the force that animates us, and is there available to us as our “true self” (Thomas Merton) — therefore, to quote Julian of Norwich, “all will be well”. This is not delusional thinking, but simply that come what may, we are in the hands of God. I often think of images like the buildings coming down on 9/11 when I sing such verses as “There shall no evil happen to you”. Do we trust in God enough to always say the Compline “mantra” (from Psalm 31) – “Into thy hands, O Lord, I commend my spirit”? The other thing to consider is “how does God take care of us?” Are we not the creatures of God? As we are in the hands of God, are we not also the hands, the eyes, the ears of God for our fellow creatures? I think this is the message that Julio Ramirez is getting at in his movie: listen to others — be aware of their needs, and help them to choose life. I’ll be letting you know when the movie comes out. This entry was posted on February 18, 2011, 10:46 am and is filed under Compline. You can follow any responses to this entry through RSS 2.0. You can leave a response, or trackback from your own site. I can’t wait to see the movie! What a stroke of genius to use the Compline Choir to set the ambience for the ‘church’ scene. I wonder how the director found out about your group? Having played hundreds of Hollywood movie sound tracks, I can identify with the slow progress and lots of hanging around waiting for something to happen. One of our basses is a producer of film shorts, many of which play on pbs. He’s done one spotlighting the interplay between choral students and Chanticleer at a music camp. Maybe it’s time for “Compline, the expose'”. Ken, you need to answer my question on the placement of the extra antiphon for Psalm 104. Before and after? Keep up the good work here. I’m always fascinated by, and look forward to your pieces. Singing with you, Bill and Tym has made me so appreciative of the sacrifices that you three have made to continue this sacred tradition. Even though I am coming up on my two year anniversary, this time together with the rest of the Compline singers is the highlight of my week! The experience of being a part of this movie only strengthens my resolve to participate in Compline every Sunday! We are making a difference! “Ken, I will also make sure we post the beautiful and inspiring article on our press section and our Facebook account. @Jefe – the director of the movie knew about Compline from attending the service over several years. Also, within the last year we had a student at the UW do a mini-documentary on the Compline Choir which you can find at vimeo.com by searching on “St. Mark’s Compline Choir”. I’ll put a link to it in a future blog, and we should see that it gets posted to YouTube. @Rene: thanks for the good words. The “Bill” he mentions is Bill Giddings, who started singing in the Compline Choir in 1959. I didn’t know about this blogsite till I received an e-mail from John Marshall yesterday. Though I was aware of the movie project from our Facebook connection, it is a gift to read your reflections on the experience. It was also good to know that Bill Giddings is still around. My first experience of the Compline Choir was in the mid-60’s when I rode up to St. Mark’s with Dave Calhoun and Bill, I think in his Checker automobile! I sat with Dave during the rehearsal and tried to sing along, but sat in the congregation during the service. Afterwards, we had the usual impromptu organ recital by Peter Hallick, then Bill, and finally Dave. At that point I actually got to press a key on the then nearly new Flentrop–a thrill of a lifetime. To know that the ministry of St. Mark’s compline service still continues and is reaching the lives of so many in even more and unexpected ways it a living testimony of God’s presence and grace. Also, I appreciated your reflections. Darn good theology for an ol’ Methodist buddy! Thank you for this entry Ken. Very moving. I’m enjoying keeping up with you here. It was just announced today, that the movie will be shown at Cinerama Theater in Seattle on Wednesday, April 30, 2014, with doors opening at 6pm. For more information, check for updates on http://www.nothingagainstlife.com . Your message is what so many are saying following the death of Robin Williams. 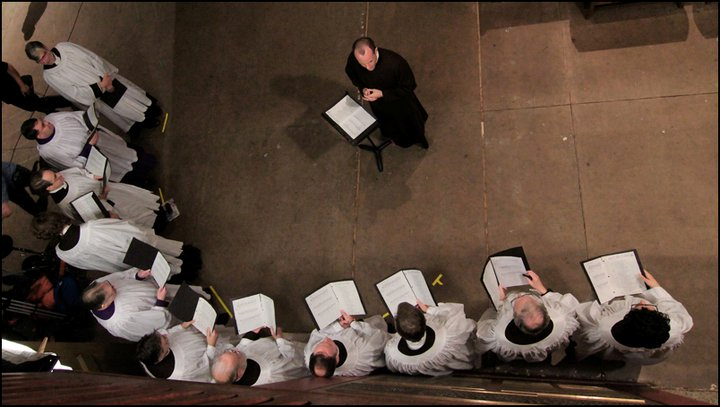 Click on "About Compline Underground" to find out more about this blog. Currently, I'm rebuilding my personal website, so if you would like to receive email messages of my blog postings, send me a comment.